Last weekend was a blur. On Friday there was a pep rally for the kids’ swim team. Saturday we went to two swim meets then I did a long run of 2+ hours where I nearly set a p.r. for the half marathon distance missing out by about 20 seconds. The run went well until about mile 12 at which point the wheels started coming off. Unfortunately, it was a 15+ mile run. Later that night we watched a movie with hundreds of neighbors on an open field adjacent to a local playground. Cinema Del Ray is a wonderful, monthly summer institution but not so good on the back and legs when you are sore. Bright and early on Sunday I took the tribe about an hour down the interstate for their first triathlon. It was big fun and pictures will follow. E, D and J all competed and had fun. Sunday afternoon I did a long ride. Ran track on Tuesday night and did a brick on Wednesday after work. Yesterday morning I went out to repeat the FTP test that I did in late May. With 9 mph wind out of the north, I averaged 25.2 mph for 20 minutes. 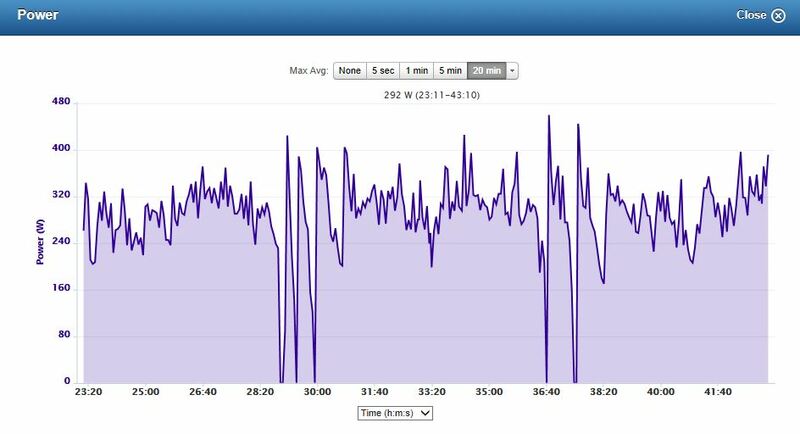 More importantly, my average watts went up from 270.2 to 292 which increased the FTP from 257 to 277. All in all, that is about an 8 percent gain in two months. I was aiming for 300 — and I know there is plenty of room for improvement. I’ll give it another go before we go to Maine next month. Twenty Minutes on Hains Point — New FTP of 277.4 with 292 watt average. At work, the past two weeks have been as busy as any two week period I can remember in years. All of this makes for one very crowded calendar and some very sound sleeping.